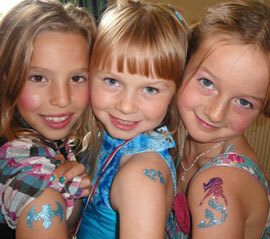 Face painting is great for a lot of things–from kids’ parties to body painting adult events. But face paint also has it’s limitations: some kids don’t like getting their faces touched and it comes off in pools or sprinklers. 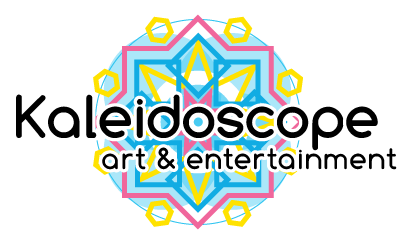 Temporary tattoos are a really great alternative to traditional face painting, and Kaleidoscope offers three different types in CT, MA, RI, NH for all sorts of events! Color and Customization: Guests are given up to 30 design choices and 9 colors to mix and match. Additional designs and colors can be created with 1 month notice, and customization fees apply. 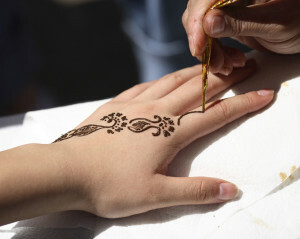 Airbrush tattoos are great for big audiences. 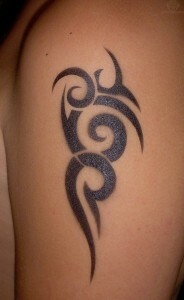 These black tribal-looking designs are the closest to real tattoos you can get! How they’re applied: Using an airbrush and stencils, we spray an alcohol-based cosmetic onto the client’s skin, then set with powder. It’s pretty simple and fast! Best used for: Large events of all ages. We have a 2 hour minimum since our set up takes a while. Safety: Because the paint is alcohol-based, it would sting your eyes! We don’t apply it to any faces, but other than that it is safe to go on skin and contains no allergens. Color and Customization: Guests are given over 100+ all-black designs to choose from. Custom designs and colors can be created with 1 month notice, and customization fees apply. 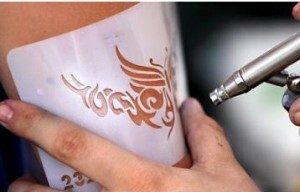 Care and removal: Airbrush tattoos can get wet and last up to a week. To remove, use rubbing alcohol or just submerge and scrub. May not be right for you: If you want to entertain toddlers or infants (the machine can look like a shot to little ones) or you’re having a short event. Guests per hour: 7-25, depending on the design size. Client can specify. Color and Customization: Depending on client’s size specifications, guests are presented with 20-50 of our favorite designs. Customizations are easily created upon guests’ requests, as long as they agree with the client’s choice of design size (and client’s goal of guests-served-per-hour). Flash tattoos are the newest trend, as seen on Beyon ce and instagram. How they’re applied: Similar to stick-on-tattoos from the 80’s and 90’s, these just go on with a sponge and water. But their metallic sheen makes them look like jewelry! Best used for: Teens, teens, and adults, but kids love them too! 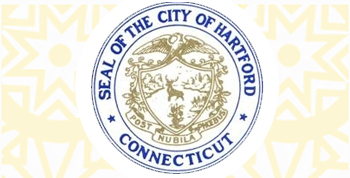 They’re just most popular with the older age groups since the designs are a little more sophisticated. Safety: No allergens here! 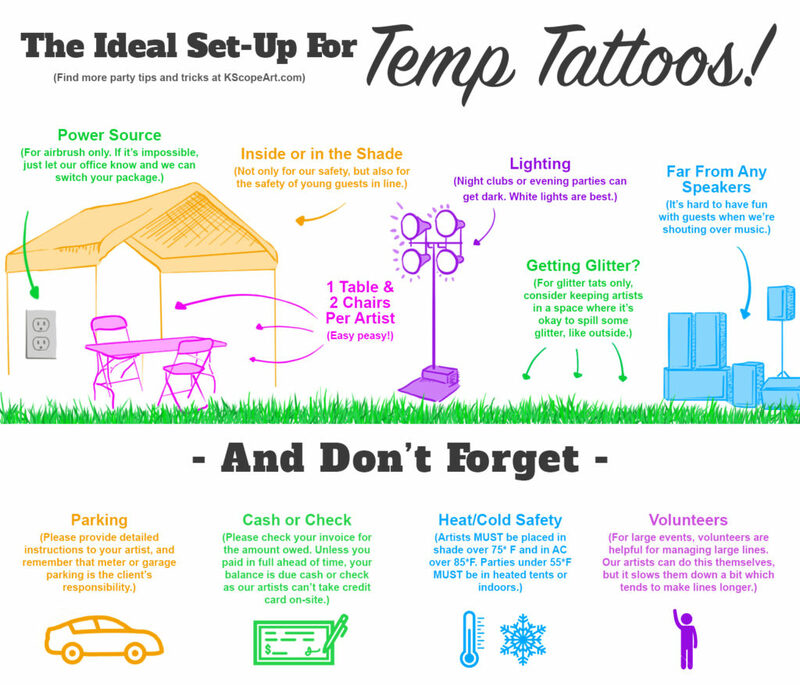 Just regular temporary tattoos, plus water. Color and Customization: Guests can choose from up to 60 gold or silver designs. Custom designs in gold, silver, or black can be created with 2 months notice; customization fee will apply. 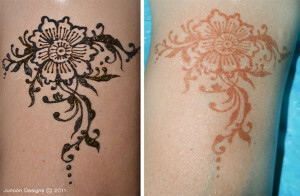 Care and removal: Flash tattoos last 2-4 days and are waterproof, or easily removed with soap and water and scrubbing. May not be right for you: You’re looking for something colorful or for young kids.